Me Troyski and Damien aka ‘Super Frenchie’ went for a bush walk South of Sydney a long way from anybody on Sunday. We went to a part of the trails were it seems there were really not any other walkers. We walked for 7 hours and only saw about 4 people in total on the bush trails. Near the beginning we found a huge pipe that seemed to lead on for a long distance so Troy suggested we carry out part of his family tradition of what him and his dad used to do of ‘Pipeing’ the Rose way! Basically you find a pipe somewhere in the countryside and walk along it and follow it for Kmâ€™s. So a bushwalk turned into a pipeing adventure. Damien wasnâ€™t impressed with walking along the pipe for km’s with his half metal leg so he stuck to the bush track. The pipe went forever, eventually ending at a dam. We ended up at a dam and this impressive bit of human construction or should I say digging was the emergency water runoff for the dam, this thing was cut SO deep into the ground, must of taken a hell of a lot of explosive to make. at the end it got very dark QUICKLY and we got lost BADLY, in the very end we staggered up a hill and onto a road, we were saved, back to humanity! We found the nearest train station and sat down and waited for out train, very tired after 8 hours out in the bush in the winter time. 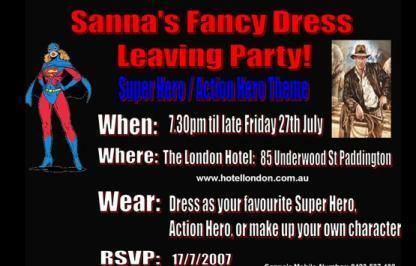 Sannas moving on from Nestle after 3 and a half years to her new postion with World Kitchen Australia and to celebrate she had a leaving party at the London hotel in Paddington. Huw the Dirty lifeguard on the deck! Lara Croft, Mick Dundee and Super Geek in the background tryign to get in a photo to show he has friends. Super geek on the decks! Super Frenchie playing pool with his baguette, which he then ate. Super heros ready for action! Sanna and I went to the Gold Coast at the weekend for the Gold coast marathon. We both trained very hard for it but I over trained I think and my right knee injury came back. I went to a physio for a few visits and he recommended I didnâ€™t do the marathon so I stopped training and did the half marathon instead. Sanna after I find her in the recovery area afterwards, she managed to complete all 42Km’s and did it in 3:50 VERY very well done, Iâ€™m really proud of her to have completed it. I completed the half marathon in 1:55, not bad considering I stopped all training 3-4 weeks before the event due to my injury. The following day we hired a car to explore the Gold Coast a bit more and we drove away from the tourist area and into the countryside and found Lamington National Park. Unfortunately for Sanna Lamingtons did not grow on the tree’s there.